Ok, I admit it: I have a boundless admiration for Bill Frisell. I follow his career since the time I listen to the particular sound of his guitar in the Naked City and even if from a few years hee has not recorded any particularly thrilling disks, I am always ready to defend his musical intelligence and his ability as instrumentalist. In the ’90 anyway he got a very happy period from the creative point of view, in rapids succession in fact he recorded a series of exceptional works where Have a Little Faith represents for me his zenith, his apex. 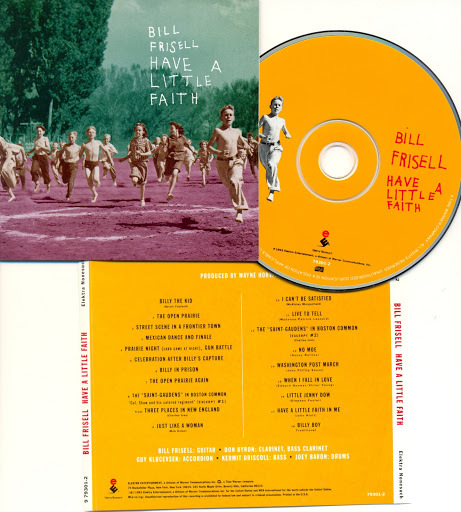 Here Frisell he succeeds in showing all of his originality elaborating and creating a record of excellent covers, light years away from the classical concept of jazz standards. Don’t pout your mouth please, I know that you can be departed prejudiced reading in the titles a track as “Live to Tell ” by Madonna, arranged in such a fantastic way replacing every pop reference with a sharp and melancholy blues, but really this cd has everything inside, a horde of so different genres that if the musicians don’t show great nerves and intelligence there is the risk to turn everything in a muddy soup, indigestible and grotesque. But our guitarist knows what to do, I remember you his militancy in that stylistic hot cauldron that Naked City were, a group of genial musicians trained to change ten musical styles in the same track in less half minute. Besides Madonna in fact they are standards jazz type like “When I fall in love”, a military march (“Washington Post March”), a piece of Dylan (the famous one “Just like to woman”), one of Sonny Rollins (“No Moe”) and also the contemporary music, the wilderness of “Billy the Kid” by Aaron Copland, a 1938 ballet known for the eclectic admixture of cowboy and American folk songs. With Frisell we have the drums of Joey Baron (companion of games in the Naked City), Don Byron’s clarinet, the bass of Kermit Driscoll and the accordion of Guy Klucevsek. The result is sensational: the clarinet of Don Byron plays extremely fresh and free, the accordion on the back ground confers some unusual sonority for a jazz ensemble and Bill Frisell plays and arranges in a various way, passing between some crazy landscapes to folk-bonanza-country to loud jazz. His version of Have to Little Faith by John Hiatt, the track that gives the title to the record is simply great and amazing, and by itself is a good reason to spend some money for the purchase of the cd, that I recommend in every way if you are particularly entangle by crazy ways to mix folk, country and jazz.